Jim Mills was born September 24, 1961 in Vancouver, BC and attended University of Hawaii. After a brief career in the NFL, Mills was signed as free agent with the BC Lions in August 1986. He played the final nine games of the 1986 season. In 1988, Mills missed the last seven games of the season due to a knee injury. Despite his injury he was named an All-Western and an All-Canadian All-Star for that year. 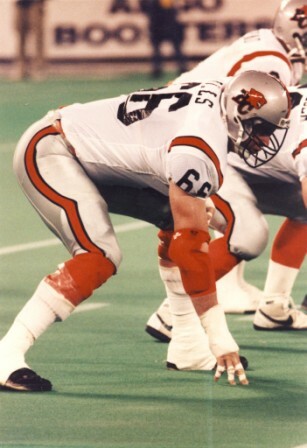 During the 1991 season, the BC Lions offensive line anchored by Mills allowed a league low of 30 sacks. For his performance Mills won the Most Outstanding Offensive Lineman for the second year in a row. In 1993, Mills was named a Western All-Star for the fifth time, and for the fourth year in a row. During this season he also recorded one fumble recovery. Mills was signed to Ottawa as a free agent in 1994. After one year with the Rough Riders, he returned to Vancouver to finish his career with the BC Lions in 1995. James Mills has been named to the BC Lions Wall of Fame and was voted as a member of the BC Lions’ 50th Season Dream Team.